It turned out that a crisis was not averted but merely postponed when Macron defeated his demagogue opponent Le Pen in the 2017 French election. While it is true that the gilets jaunes were partly impelled by an increase on fuel prices, contrary to the prevailing narrative their official demands are not limited to a carbon tax. They also consist of explicit ultimatums to increase the minimum wage, improve the standard of living, and an end to austerity, among other legitimate grievances. Since taking office, Macron has declared war on trade unions while pushing through enormous tax breaks for the wealthy (like himself) — it was just a matter of time until the French people had enough of the country’s privatization. 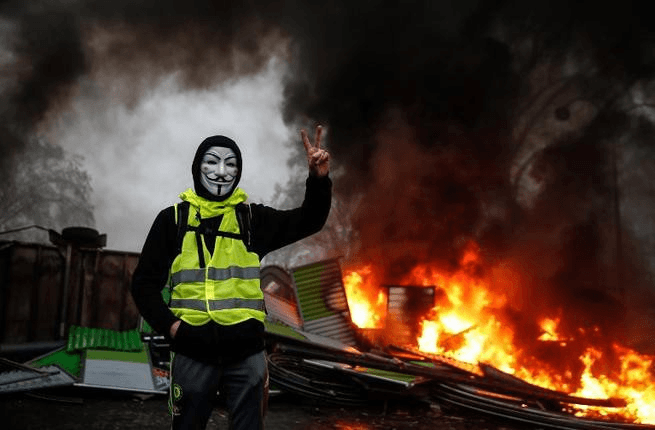 It is only a shock to the oblivious establishment why the former Rothschild banker-turned-politician, who addressed the nation seated at a gold desk while Paris was ablaze, is suddenly in jeopardy of losing power. The status quo’s incognizance is reminiscent of Marie Antoinette who during the 18th century when told the peasants had no bread famously replied, “let them eat cake” as the masses starved under her husband Louis XIV. The mysterious Bilderberg gatherings are still held to this day under notorious secrecy and are frequently the subject of wild speculation. One can imagine a topic behind the scenes at this year’s meeting would be how to address the growth of anti-EU ‘populism’ and uprisings like the gilet jaunes. 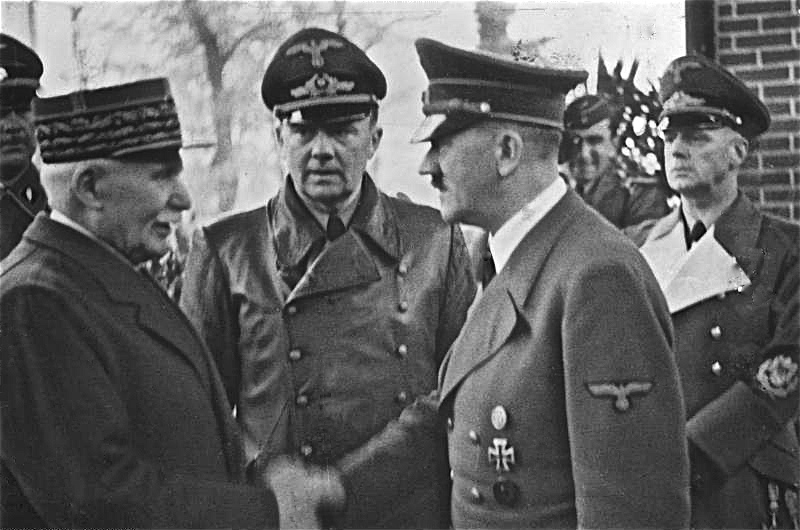 Hitlerite expansionism had been carried out on the Führer’s vision for a European federation in the Third Reich — in many respects, the EU is a rebranded realization of his plans for empire-building. How ironic that liberals are clinging to a multinational political union founded by fascist colluders while the same economic bloc is being opposed by today’s far right after its new Islamophobic facelift. While nationalism may have played an instrumental role in Brexit, there is a manufactured hysteria hatched by the establishment which successfully reduced the complex range of reasons for the Leave EU vote to racism and flag-waving. They are now repeating this pattern by overstating the presence of the far right among the yellow vests. Such delirium not only demonizes workers but coercively repositions the left into supporting something it otherwise shouldn’t — the EU and by default its laissez-faire policies — thereby driving the masses further into the arms of the same far right. Echoes of this can be seen in the U.S. with the vapid response to journalist Angela Nagle’s recent article about the immigration crisis on the southern border. The faux-left built a straw man in their attack on Nagle, who dared to acknowledge that the establishment only really wants ‘open borders’ for an endless supply of low-wage labor from regions in the global south destabilized by U.S. militarism and trade liberalization. Aligning itself with the hollow, symbolic gestures of centrists has only deteriorated the standards of the left participating in such vacuousness and dragged down to the level of liberals. There is no doubt Brexit and Trump pushed the xenophobia button and could not have come about without it. However, such criticism means nothing when it comes from moral posturers who claim to “stand with refugees” while supporting the very ‘humanitarian’ interventionist policies displacing them. Nativism was not the sole reason the majority voted to leave the EU and many working class minorities also were Brexiters. Of course their fellow workers and migrants are not the true cause of their misery. After all, it was not just chattel slaves who came to the U.S. unwillingly but European immigrants fleeing continental wars and starvation as well — the crisis in the EU today is no different.